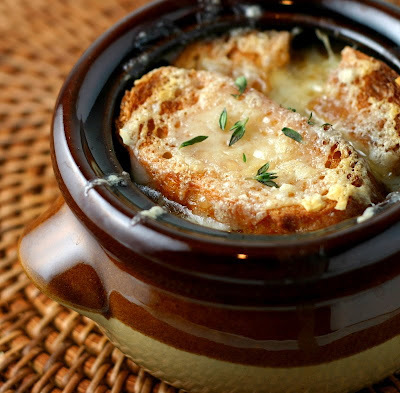 Big, Bold, Beautiful Food: French Onion Soup -- Or Is It American-Onion Soup? French Onion Soup -- Or Is It American-Onion Soup? Last night we were over the house of my friends Jessica and Peter. They invite us over a lot. And we most happily accept. 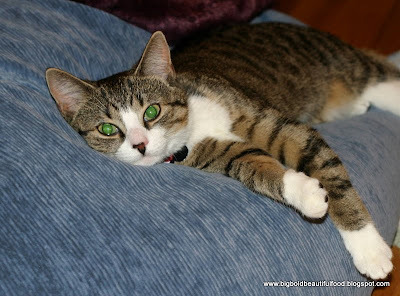 Peter is an avid cook and his current passion is pizza. We were the happy recipients of his perfected pizza dough and toppings galore for personalized individual pizzas, including caramelized onions. As Peter roasted red peppers, grilled chicken, cooked shrimp,and prepared the rest of his toppings, I leisurely stirred the onions over low heat until they reached a rich brown and their sweet and savory smell perfumed our pizza-making endeavors. So is it little surprise then that I had French onion soup on the brain for tonight's dinner? I haven't made this soup in twenty years. At that time, I lived a Friends tv show like existence in New York City. A bunch of us 20-something guys and gals lived within a block of each other, and we would have a great time cooking together on the weekends. We usually made amazing eats, but with the vat -- and I mean vat -- of French onion soup, we learned what the phrase "too many cooks in the kitchen" meant. The soup was like a salt lick from too many eager hands throwing salt in the soup. We had to throw the whole thing out. 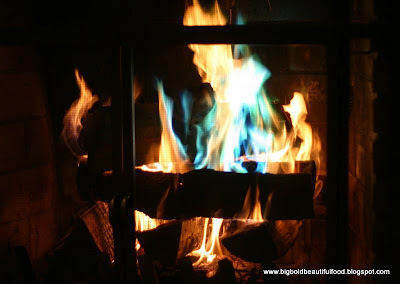 ... in front of a roaring fire (with some cool colors from coated pine cones). This time around, it was only me at the stovetop, so the soup turned out rich and flavorful. I used half beef broth and half turkey stock which I had made from the Thanksgiving turkey, so this French soup had some American panache. What a great Intercontinental pairing! I also pulled out a set of French onion soup crocks my mother-in-law gave me around 15 years ago, which I think were her friend Marianne's. These bowls are at least 30 years old. I never had an opportunity to use these until now and honor the memory of Marianne who passed away in 1985. I think the secret to a great French onion soup is to caramelize the onions over low heat for at least 20 minutes until they're browned, sweet, and a melt-in-your-mouth consistency. A quick saute will give you flabby onions and insipid soup. I didn't measure, but I was inspired by the use of vermouth and cognac in this recipe from In Praise of Leftovers. Surrounded by my family and warmed by a fire cheerily blazing in the fireplace, this soup was the perfect supper for a Sunday night in December. You know, I just had some out the other night and kept thinking to myself I should try and make my own. This is the time of year for it! French Onion Soup is a favorite winter soup in our house. I have little brown soup crocks that I too, have had for many, many years. Now part of the memory our kids will have is not just of the soup, but the cute little bowls in which they were served. The melted cheese looks divine and the alcohol choices must have made it smell amazing... with that roaring fire crackling in the backround.. perfect night! Great "friends" story too... I have similar memories! I've never made onion soup - I was always worried about standing too long in front of the stove to caramelize the onions - but now that I think about it - I am constantly standing over the stove anyway! Your post has made me decided to finally make it! Well, I am a cat-lover AND a 'French Onion Soup' lover. But, I have to ask the question: What is the problem with calling the soup 'American'. Since I am NOT a 'French' lover, MY soup tastes better -- MUCH better -- when it I think of it as American. Jaw-droppingly gorgeous soup. Seriously, that photo is stunning!! Sadly, my husband's chronic bloting problems mean no onion soup in our future. Beautiful to look at though! My husband's chronic bloating condition means NO onion soup in our future. Beautiful to look at, though! 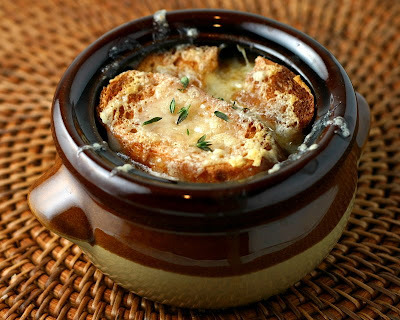 i don't normally like french onion soup, but this makes me want a bowl... right now! I can't tell you how many french onion soup recipes I have tried. None never made the mark. I'll have to see it this one will hit the spot.